In the summer of 1963, nine-year-old spitfire Starla Claudelle runs away from her strict grandmother’s Mississippi home. Starla hasn’t seen her momma since she was three—that’s when Lulu left for Nashville to become a famous singer. Starla’s daddy works on an oil rig in the Gulf, so Mamie, with her tsk-tsk sounds and her bitter refrain of “Lord, give me strength,” is the nearest thing to family Starla has. After being put on restriction yet again for her sassy mouth, Starla is caught sneaking out for the Fourth of July parade. She fears Mamie will make good on her threat to send Starla to reform school, so Starla walks to the outskirts of town, and just keeps walking. . . . If she can get to Nashville and find her momma, then all that she promised will come true: Lulu will be a star. Daddy will come to live in Nashville, too. And her family will be whole and perfect. Walking a lonely country road, Starla accepts a ride from Eula, a black woman traveling alone with a white baby. The trio embarks on a road trip that will change Starla’s life forever. She sees for the first time life as it really is—as she reaches for a dream of how it could one day be. I've found a new narrator to love. Starla Claudelle is sassy, funny, and adorable. 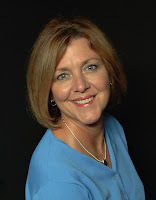 When she teams up with Eula Littleton it's a match made in literary heaven. What they learn from one another is immeasurable. They both start out a little broken and more than a little naive. The time period and setting in Whistling Past the Graveyard is a gold mine. 1963 Mississippi was ripe for change and simmering with racial tension. I've seen this book compared to To Kill a Mockingbird and I can understand why. 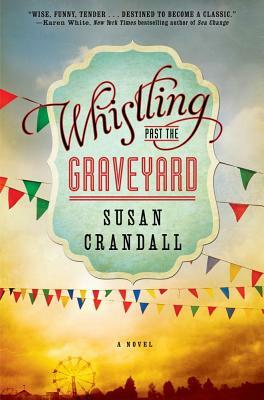 Crandall handles the issues of the time with potent sensitivity. Whistling Past the Graveyard made me laugh and put a lump in my throat more than once. I found it to be charming, powerful, and superbly written. Get your hands on a copy. Definitely. Glad you liked it! It's definitely one of my favorites of the year so far. Oh, I really want to read this one. I thought it was on my reader, but I don't see it. I'll have to buy it. Great review! This sounds so good! Especially if it's earned a comparison to TKAM. I'm so in! I hadn't heard of this one before, but it sounds really good. Beautiful cover too. It's such a good read Lindsay :) And I love the cover too, it's gorgeous! Oooh I'd pondered taking an ARC of this and I didn't because I thought I'd taken on too many. Now I shall curse myself as I purchase it for regular price. Curses! Yes! It has that sort of flavor to it :) Thanks so much for visiting! This does sound good, Jennifer! I will have to add this one to my wish list. I'm really glad to hear that! You won't be disappointed! I want to lick the cover. OMG! That made me burst out laughing! It is a great cover isn't it?? Oh then you will LOVE this one! I hope you read it Melinda! It's sooo good! LOL, right? That girl is cray-cray! 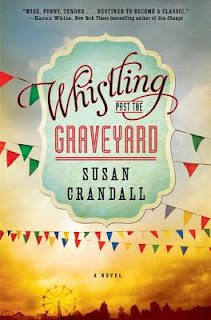 Whistling Past the Graveyard sounds like a great read! I don't usually read historical fiction set in the more recent past, but this one does sound good. Thanks for sharing your thoughts. I'm going to add the book to my wish list. You should have wrestled that person to the ground Shannon!! ;) Ah, but if you know the person you're in luck! I remember looking this one up when you had it on your "It's Monday" post. Now that I know it's as good as it sounded, I will definitely scoop it up! I'd read it for the time period and setting alone! I love that cover too. Oh, and I like sassy when it's not one my kids giving it to me. LOL. I think I'd like Starla. I am putting this right on my wishlist! I love stories set in that era (I'm 50-something years old so unfortunately I lived through some of that) and this looks like it has an interesting plot. I'd like to recommend a book set in the '50s, but perhaps with a similar plot: The Dry Grass of August by Anna Jean Mayhew. Thanks, as always, for sharing. I'm glad to hear that you're interested in this one Rita! I hope you find a copy and love it as much as I did :) I'm going to look up the one you've recommended, thank you! I really regret not requesting an ARC of this! It sounds brilliant! This definitely sounds like a good read. And I can't resist books set in Mississippi. Do you ever choose whether to read or listen to a book based on the narrator? I've always just picked books to listen to based on what I found at the library but never thought to look for the audio rather than the book because of a great narrator. I should probably start keeping a list of the great narrators I read about! I literally just put this one on my queue after seeing it come in my library. So glad to see you loved it so much! Nice timing Christine! I hope you enjoy it as much as I did! Sounds great! Think I will snag a copy! I hope you do Jennine, it's fantastic! I grabbed a NetGalley copy, so I'll have to see if it's still valid! I am still to read To Kill a Mockingbird! This one sounds good! Glad to see you enjoyed this one. One of my favorites of the year so far. And to think I only requested it because of the cover! I thought it was GREAT :) The cover was the first thing that attracted me as well! Just catching up on some reading and came across this review. I'm reading this right now and at this point, I can't agree with you more about this book. Fantastic! I love Starla Claudell. What an amazing child! And the writing is more than wonderful. This sounds like it is going to live up to my expectations. Thank you for the review. I look forward to reading it myself.